Today I'm a bad blogger. I just finished a miserable 12 mile run and I'm about to head into the big city for a family wedding on Saturday. Therefore, I'm going to leave you with one of my favorite someecards. That is all. How true. 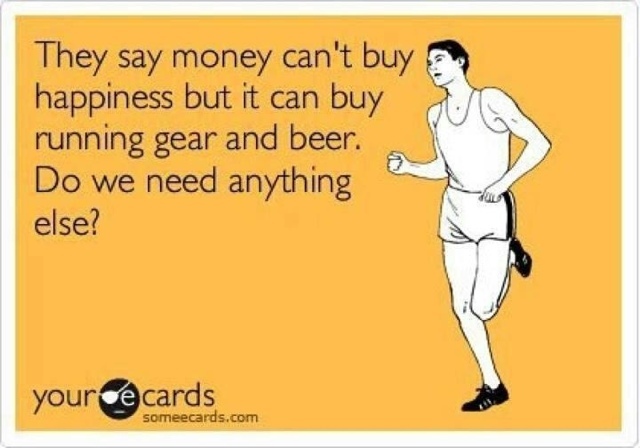 Running shoes, shorts, a Garmin and weiss beer. That's all I need! Is Chicago the big city? Why was your run so miserable? Big races without beer at the end are disappointing. Yes, Chicago is the big city! I'm working on a post right now explaining why this run was so terrible.